Everybody knows the Brothers Grimm’s most famous fairy tale. But what if they told it from the wrong point of view? Stepsisters, written by Flip Kobler & Cindy Marcus and directed by Jenni Merritt, tells the totally-true-and-not-at-all-made-up version of the little cinder girl. 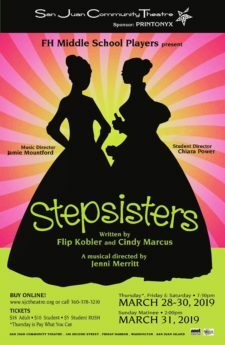 When Drew and Beth are thrown into the dungeon for conspiring against the throne, these stepsisters, who are not wicked, evil and certainly not ugly, are forced to tell their fellow prisoners the real story of what happened with Cinderella. Part flashback, part story theatre and all high-octane musical comedy, the story unfolds in ways the Grimm tale never did.